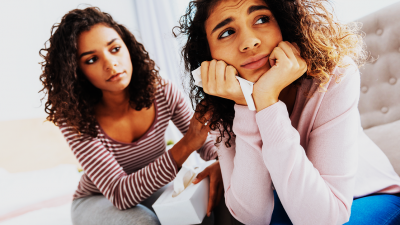 Speaking to your friends about abuse you have experienced at the hands of your partner can be incredibly hard. It’s important to understand that it’s a choice that is totally up to you and you’re not forced to tell anyone about an experience you’ve been through. However, it is good to open up about something that has affected you badly so that you can get the love and support you need (and deserve). If you’re wondering how to approach the topic of an abusive partner with your friends, here’s how to do it safely and openly. When opening up about something personal such as an abusive relationship, it’s good to only speak to those you trust well. It may be tempting to tell as many people (especially your fellow girls) about how abusive and horrible this person is, but over-sharing this type of information with untrustworthy people can create more problems than it’s worth. Choose one or two close friends who you know you can trust to keep things confidential, and be sure to ask them not to share any information which you’d like to keep private. Remember to be honest about what has happened- don’t add in things that are exaggerated or untrue- your friends will appreciate you being sincere. Remember that you’re not trying to convince them of anything- you’re just sharing your experience in hopes of getting their advice and support during a hard time. Clearly explain what you think of the abuse, and why you feel the way you do. It’s fine if they aren’t quite sure what to say or how to react- remember that they’ll probably be a little stunned and confused. If you’ve opened up to your friends and they don’t understand or believe you, this can feel devastating. You might feel very lonely if your friends don’t understand what you’ve gone through. If this happens, try to remember that they’ve had different life experiences compared to you. They also haven’t necessarily seen that side of the person you’re speaking about, so they may be misled by your abuser’s fake front. Remember that you don’t need to explain or prove yourself to anyone- your feelings are valid and you know what you’ve been through. Focus on healing and keeping in touch with the loved ones who have your back. It’s very helpful to have a support system when recovering from an abusive relationship- even if you may feel alone, Choma, trust me when I say that you’re not. Reach out to those you trust and love in your life, especially if you’re feeling helpless and trapped. You can also find a lot of support online and within your community, especially from other survivors of abuse who can understand what you’ve gone through. Millions of people have experienced abusive relationships, and have been able to heal and lead happy, healthy lives. Believe in your strength- whether you’re standing with friends, or alone.